Stylish Medical BraceletsMedical bracelets are a necessity for those with allergies, health conditions or who take prescription medication. Many of us wear them because we have to, not because we want to, and some people even refuse to wear the same, basic bracelet every day. 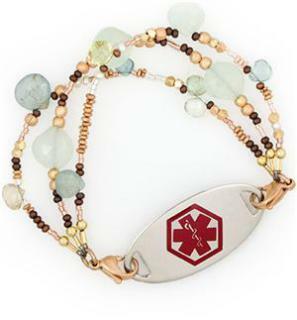 In an emergency, a medical bracelet alerts professionals to possible problems or prescription complications. It seems silly to keep this information from those who need it because the bracelets are boring. Companies like Lauren's Hope realized this and created interchangeable medical bracelets. You can now wear a different, stylish bracelet every day! Lauren's Hope began creating stylish medical bracelets when a little girl named Lauren refused to wear her bracelet because it was ugly and drew attention to her diabetes. The bracelets became a huge success, and although the medical bracelets were originally meant for children, Lauren's Hope expanded to medical alert bracelets for men and women too. There's no reason not to wear you medical bracelet now. When it comes to your health and safety, wearing the correct medical information is key. Don't avoid it because your bracelet seems to accentuate your disease or because the jewelry isn't pretty. With trendy bracelets, no one will see a medical bracelet. They'll just see a lovely piece of jewelry. Christmas is coming up, and these would make lovely gifts. Pick one up for a loved one or for yourself here. Learn more about why medical bracelets are important at Medical ID. You can also check out my other fashion and beauty blogs here!